Several years ago, a New Yorker cartoon pictured a ponytailed young woman and man in sunglasses cruising past a palm tree in a convertible. “I have no idea what gluten is, either, but I’m avoiding it, just to be safe,” read the caption. These days, with entire supermarket aisles dedicated to gluten-free products, and asterisked menu items at restaurants denoting gluten-free, most of us know that gluten refers to proteins occurring in wheat, rye and barley and can cause serious health effects in people with celiac disease, gluten intolerance and gluten sensitivity. In fact, the gluten-free food market has become a booming business. Udi’s and Glutino are major gluten-free brands on supermarket shelves, and General Mills has its own gluten-free product line. Food entrepreneurs are opening gluten-free bakeries. Even the Girl Scouts have a gluten-free cookie. 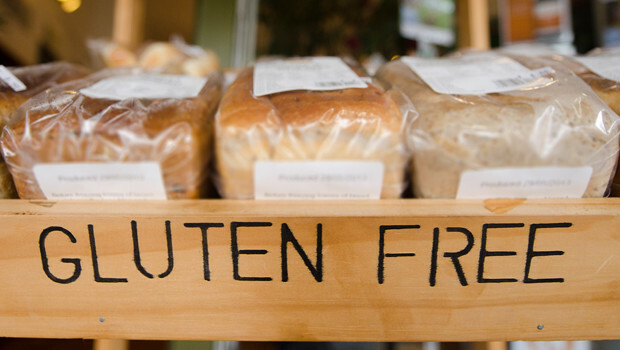 Households reporting purchases of gluten-free food products rose to 11 percent last year, according to Nielsen. Makers of products that are naturally gluten-free, such as rice crackers, cranberry juice and popcorn, have hopped on the bandwagon, sporting gluten-free labeling. It is estimated that 3 million people in the United States have celiac disease, an inherited chronic inflammatory auto-immune disorder. For people with celiac disease, consumption of gluten results in the destruction of the lining of the small intestine and the risk of other serious health conditions. Foods that contain gluten trigger production of antibodies that attack and damage the lining of the small intestine. Such damage limits the ability to absorb nutrients and puts celiac sufferers at risk for nutritional deficiencies leading to anemia, osteoporosis, growth retardation, infertility, diabetes, miscarriages, short stature, autoimmune thyroid disease, and intestinal cancers. There is no cure for celiac disease, notes Andrea Levario, executive director of the American Celiac Disease Alliance, and the only way to manage the disease is through diet, by not eating gluten. Without a standardized definition of “gluten-free,” celiac sufferers could never really be sure if their body would tolerate a food with that label, she adds. Beginning in summer 2013, the FDA issued a rule defining “gluten-free.” The rule also requires foods with the claims “no gluten,” “free of gluten,” and “without gluten” to meet the definition for “gluten-free.” Before the rule there were no federal standards or definitions for the food industry to use in labeling products “gluten-free.” An estimated 5 percent of foods formerly labeled “gluten-free” contained 20 ppm or more of gluten. The requirements apply to packaged foods labeled on or after August 5, 2014. Consumers should be aware that there may be some products still on store shelves that were produced and labeled before the compliance date. The date was established one year earlier to allow food manufacturers sufficient time to make changes needed in the formulation or labeling of foods that bear a gluten-free claim. Gluten-free foods must contain less than 20 parts per million (ppm) gluten. According to the FDA website, epidemiological evidence suggests that most individuals with celiac disease can tolerate variable trace amounts of gluten at levels less than 20 ppm. Foods may be labeled “gluten-free” if they are inherently gluten free, such as eggs, butter and seltzer. Foods imported into the United States must meet the same federal requirements as foods produced domestically. Oats and oatmeal often confuse gluten-free consumers. The grain itself does not contain gluten, but there may be cross contamination with other grains containing gluten. The practice of crop rotation, as well as the shared use of harvesting and transport equipment and storage silos, often results in gluten-containing grains coming into contact with other grains, legumes and seeds that are naturally free of gluten. In addition, manufacturing facilities that use shared production equipment to produce foods both with and without gluten could result in gluten cross-contact. To comply with the new rule, oats labeled gluten-free must contain less than 20 ppm gluten. Neither the final rule nor FDA’s general food labeling regulations prohibit the use of a statement like “made with no gluten-containing ingredients” or “not made with gluten-containing ingredients” on any food products, provided that the statement is truthful and not misleading. However, unless the label of the food including such a statement also bears a gluten-free claim, consumers should not assume that the food meets all FDA requirements for the use of the “gluten-free” claim. The final rule does not prohibit the inclusion of an advisory label statement, such as “made in a facility that also processes wheat,” on foods labeled gluten-free. The FDA will continue to work with, educate and monitor industry on the use of the gluten-free claim. Outreach will be conducted to assist the industry, as needed, to ensure that the provisions of the rule are fully understood. In addition, FDA will use its existing compliance and enforcement tools, such as inspection, laboratory analysis, warning letters, seizure and injunction to ensure that the use of the claim on food packages complies with the definition. Those who dine out would also like to be able to identify gluten-free foods served in restaurants and stores that serve prepared foods. The gluten-free final rule applies to packaged foods, which may be sold in some retail and food-service establishments. The FDA says that restaurants and other establishments making a gluten-free claim on their menus should be consistent with FDA’s definition. State and local governments play an important role in oversight of such businesses, says the FDA website. The FDA rule applies to dietary supplements, regulated by the FDA, but excludes foods whose labeling is regulated by the U.S. Department of Agriculture (meats, poultry, and certain egg products) and the Alcohol and Tobacco Tax and Trade Bureau (most alcoholic beverages, including distilled spirits, wines that contain 7 percent or more alcohol by volume, and malted beverages that are made with malted barley and hops). If a person sensitive to gluten eats a product labeled gluten-free and becomes ill or otherwise experiences adverse health effects, they can report their concerns to the FDA by calling 240.402.2405 or e-mailing CAERS@cfsan.fda.gov. According to Felicia Billingslea, director of FDA’s division of food labeling and standards, consumers should know that some foods labeled “gluten free” that are in the marketplace may have been labeled before the rule’s compliance date of August 5, 2014. If consumers have any doubts about a product’s ingredients and whether or not the product is gluten-free, they should contact the manufacturer or check its website for more information.